*The $75 Bungalow-B Exclusive Store Gift Code Can Only Be Redeemed Once. Check out all the Bungalow-B Exclusive Store Items Below to see what you can redeem with your Bungalow-B Exclusive Store Gift Code! *The $50 Bungalow-B Exclusive Store Gift Code Can Only Be Redeemed Once. Check out all the Bungalow-B Items Below to see what you can redeem with your Bungalow-B Exclusive Store Gift Code! *The $25 Bungalow-B Exclusive Store Gift Code Can Only Be Redeemed Once. Check out all the Bungalow-B Items Below to see what you can redeem with your Bungalow-B Exclusive Store Gift Code! Bungalow-B (www.Bungalow-B.com) is the official online fan club and community for recording artist Michael Bublé. As a member of Bungalow-B you will have exclusive access to contests, special ticketing opportunities, events, polls, and the online community forum where you will be able to interact with other fans from around the world. HOW DO I JOIN BUNGALOW-B? Click on the package you want and you will be taken through the registration process and/ or checkout process on our secure site, where you will create your unique username and password for Bungalow-B (please note that usernames cannot be changed, once created). For more information on MEMBERSHIP PACKAGES, PAYMENT METHODS, SHIPPING, and RETURN INFORMATION, please see the other relevant sections of this FAQ. I Bought a Luxury, Glam or Music Membership. How Do I Redeem My Membership? If you bought one of these membership packages, you should have received an email from the online store with a fan club membership redemption code and instructions via email. If you didn’t receive the email, contact: support@bungalow-b.com. 2. Click the "REDEEM GIFT CODE" button, located under the package you purchased. 4. You will see on the Bungalow-B homepage that your redemption was successful! 1. If you are a current member and wish to renew your membership, please login to your account. WHERE IS MY 10% DISCOUNT CODE FOR THE OFFICIAL ONLINE STORE? 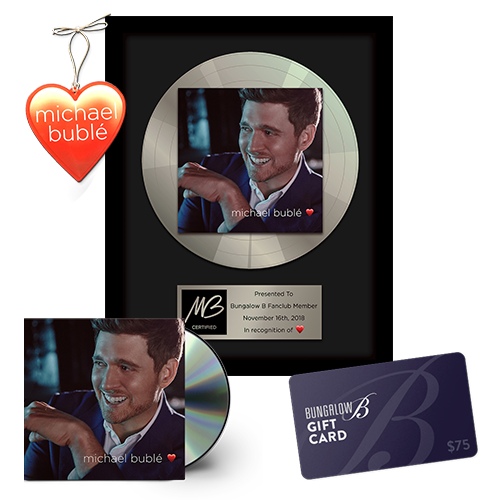 All Bungalow-B members are entitled to 10% items purchased in the official online store at http://store.michaelbuble.com/. This code is always available to you in your Bungalow-B Account. Sign in and go to:http://www.bungalow-b.com/user OR sign in and click VIEW MY PROFILE in the USER NAVIGATION MENU at the right of the page. The 10% discount code (as well as all other codes that apply to your account) will be listed in the lower section of the right-hand column on the VIEW MY PROFILE page. Copy and paste this code into the special offer/coupon code field during the checkout process and be sure that the percentage difference applies to your order before completing the checkout process. The MY PROFILE page is where you will find listed the different promotion or discount codes associate with the purchase of your Bungalow-B membership. This is where ALL Bungalow-B members will find their 10% official store coupon code, as well as ticket pre-sale codes if there are active pre-sales happening. These codes will be available to you at any time, while signed in to your account, listed in the details of your profile. For your convenience, we accept payment online from your VISA, MASTERCARD, DISCOVER, or AMERICAN EXPRESS credit card (or check card featuring the logo of one of these major credit organizations). We strive to make special ticketing offers and seating arrangements available for Bungalow-B Members whenever possible. Stay tuned to your member e-mails and the News section of the site for details on current or upcoming opportunities. PLEASE NOTE: Tickets are sold on a first come, first serve basis and are not guaranteed. All fan club subscription sales are final. There are no refunds, returns, exchanges or credits for fan club membership subscriptions for any reason, including inability to purchase reserved tickets or inability to purchase preferred seats. Operating System: Windows Vista, XP, Mac OS 10.4 and above. Bungalow-B Fan Support is available to assist with all things Bungalow-B (the website, offers, and opportunities included therein). Please note that requests received to http://www.bungalow-b.com/contact regarding the above listed issues will receive no response, so that we might better assist those which we can. *While autographs and meet & greets may potentially be offered as part of opportunities made available through Bungalow-B, we cannot provide them on an otherwise individual basis. If you are having trouble viewing the site or some of its elements, please first double-check the system requirements, listed elsewhere in this FAQ. If all of your software is up-to-date, please try clearing your web browser's cache of cookies/temporary internet files, closing the program, reopening it, and logging back in to your account. For more information on clearing your cache, please refer to the "Help" section of your particular browser software. If you continue to experience trouble with viewing the site or have any other questions not answered elsewhere in this FAQ, please feel free to contact us here: http://www.bungalow-b.com/contact. For detailed package information, please visit http://Bungalow-B.com/join where you will find basic information regarding each and all of our Member Package options, as well as the package details for each. Shipments to addresses within the United States are sent by UPS or United States Postal Service First Class Mail depending on weight and usually take 7 to 10 business days to arrive. International shipments including Canada and Mexico are sent by United States Postal Service Economy and usually take up to 21 business days to arrive. International shipments may be held by your local Customs Authority for an additional 10 to 14 days depending upon the customs laws in your country. Therefore, it is best to allow for 4 to 5 weeks for delivery. Once you have purchased your Bungalow-B membership and have created your unique account and password, you may access your membership by visiting Bungalow-B.com and logging in using the fields provided at the top right of that first page. Enter the username that you created with your account, as well as your password in the appropriate fields, click "Sign In" and you will be taken to the FAN CLUB HOME PAGE. If you have forgotten or misplaced your password, simply click the "Forgot Password?" link to the right of the login fields, and you will be prompted to enter either your e-mail address or unique member name. Instructions on how to access your account and reset your password will then be sent to the e-mail address that was entered when you created your account. How do I login to the new site for the first time? Log into the new site by visiting Bungalow-B.com and at the top of the page in the login area, enter the login information that you have associated with your Bungalow-B membership and the password that you have always used to enter the site. Once you have logged in to your Bungalow-B member account, you can navigate the site using the NAVIGATION BAR, located at the top of every page in Bungalow-B. Along the very top of the page is a list of the different sections of Bungalow-B. They are: "HOME -- NEWS -- TOUR -- SHOP* -- MEDIA -- MUSIC – COMMUNITY- CONTESTS -- FORUM -- 'MichaelBuble.com'*"
Each word is a link to that particular section of the site. *SHOP takes you to the official MB online store, just as "MichaelBuble.com" takes you to the official public site (MichaelBuble.com), as the heading indicates. The other sections are explained in more detail below. Located on every page within Bungalow-B, toward the right of the page (beneath the photo of Michael) you will find an USER NAVIGATION MENU with links to help you manage and update your personal Bungalow-B Account. If you have uploaded a photo, that photo will appear beside your member name. Here, you also have the option to LOGOUT of your Bungalow-B account by simply clicking the "Logout" link in this area. Once you have clicked on one of these, you will be taken to that section of the "MY ACCOUNT" page. Note also that once you have successfully navigated to the MY ACCOUNT page, you may use the "tabs" that appear in red, horizontally, above your account information, to navigate to the different sections. All views on the MY ACCOUNT page have your profile information listed down the column on the right. Clicking on VIEW MY PROFILE or selecting the VIEW tab from the options on the MY PROFILE page will show you the profile that you have created, as it appears to other members of Bungalow-B. Legacy members are members that keep their membership active for 2 consecutive years and will receive advanced access to presales (when applicable). Legacy members receive up to 4 tickets to one show or 2 tickets to 2 shows. HOW DO I KNOW IF I’M A LEGACY MEMBER? Clicking on EDIT ACCOUNT or selecting the EDIT tab from the options on the MY PROFILE page will open a form, allowing you edit your profile information. When adding information to your profile with the EDIT feature, please feel free to include as much or as little information in the available fields as you would like. By no means is this information required for your Bungalow-B membership, but is meant only as an opportunity to introduce yourself to other fans as you continue to become a part of this growing online community. -Under ACCOUNT you can make basic changes to your overall account. Here you can change your password by entering a new password in the fields provided and clicking SAVE at the bottom of the page. The next time you login, you will need to use this new password. You can also update your Email Address here. This will help ensure that you receive email updates regarding your Bungalow-B account or notifications of upcoming ticket presales. You can also change your private message notification settings here. The Account PROFILE view also includes an area to upload your PROFILE PICTURE, as well as edit your contact settings. -Under PROFILE you can add as much information as you like, in the fields provided, to share your MB and life experiences with other members of Bungalow-B. Enter the information which you would like to publish into the available fields and be sure to click SAVE at the bottom of the page when you are done. This information can be edited at any time by simply returning to this area of the site. -Under PERSONAL you can add still more information about you. Information entered here as well as in other parts of your profile will be used to help other members find you using the FIND FRIENDS feature in the COMMUNITY section. Provide your or City/State information (if you would like to) so as to be part of the LOCAL members search option in the COMMUNITY section of the site. To post a JOURNAL ENTRY to your profile, or add PHOTOS, simply click the respective link for JOURNAL or PHOTO next to "ADD NEW" at the bottom of the USER NAVIGATION MENU. You will be provided with the appropriate fields to publish your entry or upload your photo. To view already posted JOURNAL entries and PHOTOS, click on the MY JOURNAL or MY GALLERY links (respectively) from the USER NAVIGATION MENU. You can publish your own personal concert memories regarding a particular performance date, which will be published and viewable to the rest of Bungalow-B. Click on "ADD NEW: ... MEMORY" in the USER NAVIGATION MENU and fill out the fields provided. The “Concert” field refers to the concert date you are writing a memory about. Concert memories will show up in the Tour Archive section http://www.bungalow-b.com/tour/archive for the respective tour date. Immediately after logging in to your Bungalow-B account, you will be taken to the FAN CLUB HOME PAGE. This page is an overview of recent activity and information about Bungalow-B, featuring recent news items, links to current contests, interactive polls, as well as to recently uploaded content. The NEWS section of Bungalow-B is where you will find posted the latest news items regarding MB and your Bungalow-B membership. The news posts are listed in the light-grey on the center-left of the page, starting with the most recent. You can navigate to older news posts by selecting the "page number" at the bottom of the light-grey field, or clicking the arrow-shaped links on either side. Click on the HEADLINE for the story, or the "Read More" link at the bottom of each story to view the complete post as well as all posted comments. Click "Add Comment" at the bottom of each story, and you will be provided with boxes in which to enter a "Subject" line and "Comment" message that will be posted along with your member name and profile picture at the bottom of each news story. Visit the TOUR section to find information and comment on past and upcoming performances. The TOUR section is divided into two categories - UPCOMING events, and our ARCHIVE of past events. Switch between these two categories by clicking on the words UPCOMING or ARCHIVED at the top of the light-grey field of tour information. You can navigate to older tour date posts (in either UPCOMING or ARCHIVED) by selecting the "page number" at the bottom of the light-grey field, or clicking the arrow-shaped links on either side. The TOUR page, in addition to the NEWS page, is a good place to look for information regarding any current or upcoming ticketing offers for Bungalow-B members. Clicking TICKET INFO on the tour page will supply you with the necessary codes and information for any current ticket offers which may apply. Click on the red-linked tour date in the left-hand "Date" column for an overview of details for that particular event. Here, as in the NEWS section and elsewhere, you may post a comment using the fields provided that will appear whenever you or another member views the details of this event in the future. When tickets are available for particular events, a link will be provided in the right-hand "Tickets" column, listed by event on the TOUR page, which will direct you to the appropriate ticketing agency website. Click on the event date (or the "More Info" link) to view the full details and member comments, or to post your own comment, regarding the past performance(s) of your choice. The MEDIA section of Bungalow-B is where you will find an archive of photos, videos, and other media provided by Bungalow-B, as well as media that you and other members of Bungalow-B uploaded via the "My Gallery" feature on your account. Clicking on PHOTOS brings up another set of tabs to help you navigate our collection of still images. Feel free to explore the different categories to narrow your search through the photos. Click directly on the image of your choice to see it in more detail, as well as to review all posted member comments. Click ADD COMMENT to post a response of your own. You will be taken to the page featuring the image and will be provided blank fields where you can enter your comment and save it to the image, for viewing by the rest of Bungalow-B. Clicking on VIDEOS brings up another set of tabs to help you navigate our collection of video content. Select from this list to narrow your search through the videos. Also, to help narrow things down, each heading is accompanied by one or more categories listed vertically along the left of that light-grey field. Click on these to get even more specific. Click directly on the video of your choice to see it play, as well as to review all posted member comments. Click ADD COMMENT to post a response of your own. You will be taken to the page featuring the video and will be provided blank boxes where you can enter your comment and save it to the video, for viewing by the rest of Bungalow-B. The MUSIC section of Bungalow-B provides a complete discography for Michael Bublé, as well as track listing, and links to purchase the music from various online retailers. You may also comment on each item in the list by clicking the "Add New Comment" link below each track listing. The COMMUNITY section of Bungalow-B is your window into the worlds of your fellow Bungalow-B members, and presents several opportunities for everyone to interact online. Click on any of these links to view associated posts by other members of Bungalow-B, or click "MEMBERS' to browse or search current Bungalow-B members by member name. REDEEM THE BUNGALOW-B STORE GIFT CODE FOR EXCLUSIVE ITEMS BELOW! Products in this store are for Fan Club members only. If you are not a member SIGN UP now! Legacy members are those that have purchased a Bungalow-B membership for the past 2 or more consecutive years. In order to maintain your legacy status, your membership can't lapse or expire. ***Bungalow-B pre-sale ticket offers are not guaranteed with the purchase of a membership package. Tickets are limited and Bungalow‑B members are strongly advised to purchase pre‑sale tickets as soon as the pre‑sales begin. New Bungalow‑B Registration following the start of pre‑sales does NOT guarantee Michael Bublé pre‑sale tickets. Pre‑sales sell out very quickly. Legacy Members have the opportunity to purchase a maximum of 4 pre‑sale tickets per show. Non-legacy members can purchase up to 2 tickets for the entire tour. All specifications are subject to change without notice. ****10% Michael Bublé Official Store Discount code is not valid on music. We accept payment by major credit cards.